All the cool convenience of our smartphones, tablets, computers, and Internet-based services come with a hidden price – POWER. critical materials, missing application of recycling technologies in many countries, and missing law enforcement or code of conducts regarding fair labor. Beside Apple’s ecosystem there is a much greater and more important one, our planet. In April 2014 scientists stated that parts of China are no longer suitable as a habitat for human beings, animals, and plants because of a tremendous pollution load in the air, the water, and the soil. As seen from the perspective of physics excessive power used by machines always goes along with excessive generation of heat. So it’s obvious that we pay the price for cooling down the powerful equipment needed for communication and unlimited access to sources of information. On January 27, 2014, the Department of Ecology’s Air Quality Program received a Notice of Construction application (air permit application) from the Microsoft Corporation proposing to construct and operate the Oxford Data Center in Quincy, Washington. Microsoft has applied for an air permit because the proposed data center would install 36 2.5 MW emergency back-up diesel engine generators, one 0.75-MW emergency back-up diesel engine generator, and 32 cooling towers. The projected build up of new data center electric loads led directly to forecast increases in energy-related air pollution, both globally and locally. Greenhouse gas (GHG) emissions such as carbon dioxide from fossil fuel-fired electric generators are a major cause of global climate change. The forecast increases in data center electric demand implied a growing source of GHG emissions. This is cause for concern. The international community is attempting to reduce GHG emissions amid broad scientific and international consensus that climate change is a major threat and must be taken seriously. Air pollution from diesel generators causes environmental health problems. Each planned data center includes as many as two or more times redundant backup diesel generator capacity, to use when the electric grid is unstable or unavailable. Diesel generators used for emergency backup power supply are essentially unregulated. They are a notorious source of very high levels of damaging air pollutants, including soot, nitrogen oxides (NOx), which form ground level ozone (smog) during hot sunny weather, and others. Coincidentally, the electric grid is most unstable and at risk of failing during hot periods of peak air conditioning demand. A data center is a facility used to house computer systems and associated components, such as telecommunications and storage systems. It generally includes redundant or backup power supplies, redundant data communications connections, environmental controls (e.g., air conditioning, fire suppression) and various security devices. Large data centers are industrial scale operations using as much electricity as a small town and sometimes are a significant source of air pollution in the form of diesel exhaust. According to Emerson Network Power 509,147 data centers worldwide were operated in 2011. I didn’t find updated information but it’s obvious that we have a lot more today because of the gaining popularity of mobile devices. Most data centers, by design, consume vast amounts of energy in an incongruously wasteful manner, interviews and documents show. Online companies typically run their facilities at maximum capacity around the clock ensuring 99.99% availability, whatever the demand is. As a result, data centers can waste 90 percent or more of the electricity they pull off the grid. In Silicon Valley, many data centers appear on the state government’s Toxic Air Contaminant Inventory, a roster of the area’s top stationary diesel polluters. Worldwide, the digital warehouses use about 30 billion watts of electricity, roughly equivalent to the output of 30 nuclear power plants, according to estimates industry experts compiled for The New York Times. Data centers in the United States account for one-quarter to one-third of that load, the estimates show. The most commonly used metric to determine the energy efficiency of a data center is power usage effectiveness, or PUE. This simple ratio is the total power entering the data center divided by the power used by the IT equipment. Power used by support equipment, often referred to as overhead load, mainly consists of cooling systems, power delivery, and other facility infrastructure like lighting. The average data center in the US has a PUE of 2.0, meaning that the facility uses one watt of overhead power for every watt delivered to IT equipment. State-of-the-art data center energy efficiency is estimated to be roughly 1.2. Some large data center operators like Microsoft and Yahoo! have published projections of PUE for facilities in development; Google publishes quarterly actual efficiency performance from data centers in operation. The U.S. Environmental Protection Agency has an Energy Star rating for standalone or large data centers. To qualify for the ecolabel, a data center must be within the top quartile of energy efficiency of all reported facilities. Downloading apps and media files, syncing via iCloud, using SIRI, backing up iOS devices needs an incredible amount of energy. Some of the features are quite wasteful if we think about a new contact entered in Contacts, then sent thousands of miles via the internet to see it some seconds later on a second iOS device which is just two feet apart. 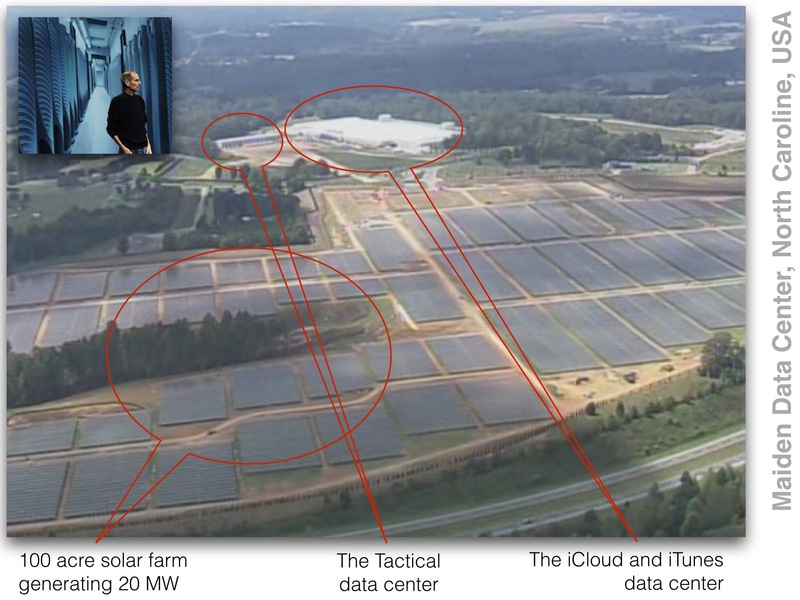 Apple runs its biggest data center in Maiden, North Carolina. 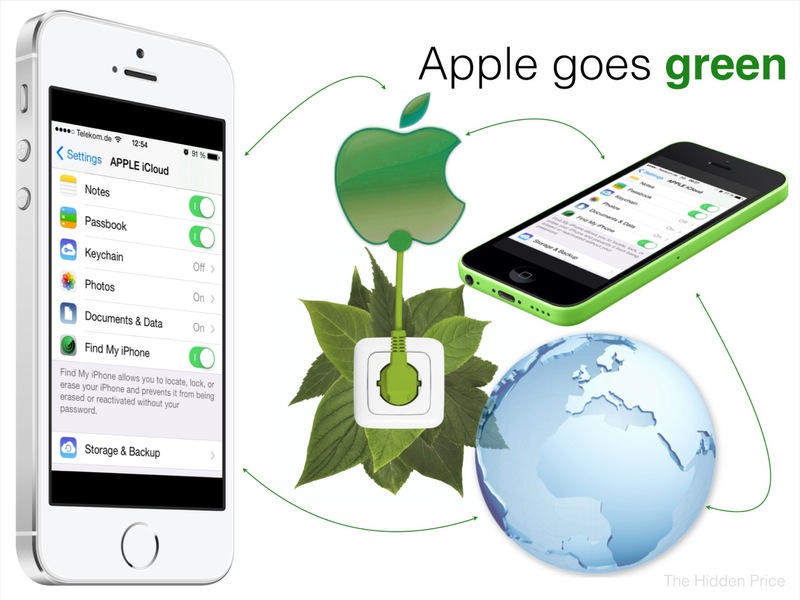 It houses servers and telecommunications equipment responsible for iCloud, Siri, iTunes and other online services. 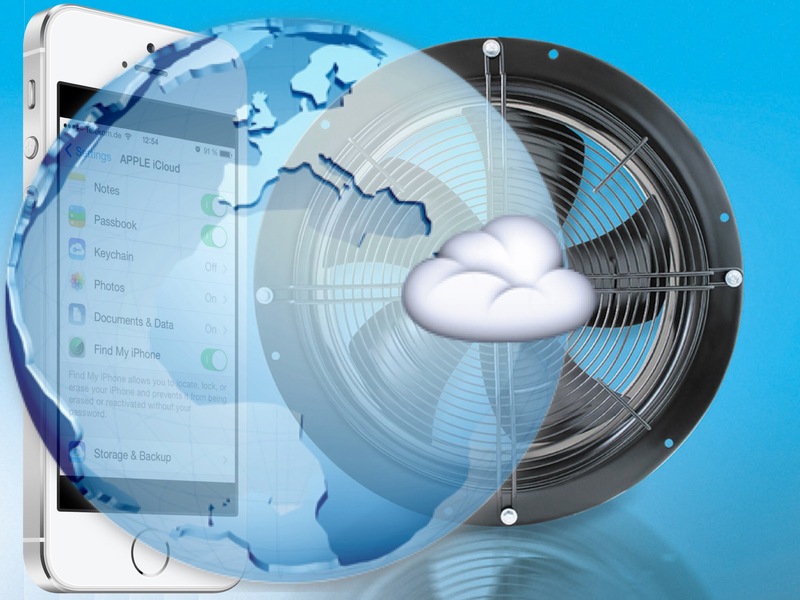 But using Apple’s services in the cloud no longer means polluting the air. The new HQ (“Spaceship”) being built in Cupertino, will use 30% less energy than an equivalent building, and will be home to around 7,000 trees. Apple decreased the material required to make its products – the new iPad Air uses nearly one-third less material, by weight, than the original iPad. All the company’s retail stores will now take back Apple products for recycling, for free; previously customers had to buy a new product to recycle an old one. In the UK and US, an ongoing scheme offering payments for old iPhones, iPads and Macs also continues. Are these statements for publicity only? Well, Tim Cook recently told climate change sceptics that they should ditch Apple shares if they did not like the company’s backing for renewable energy and sustainability. We do things because they are right and just and that is who we are. That’s who we are as a company. When I think about human rights, I don’t think about an ROI. When I think about making our products accessible for the people that can’t see or to help a kid with autism, I don’t think about a bloody ROI, and by the same token, I don’t think about helping our environment from an ROI point of view. 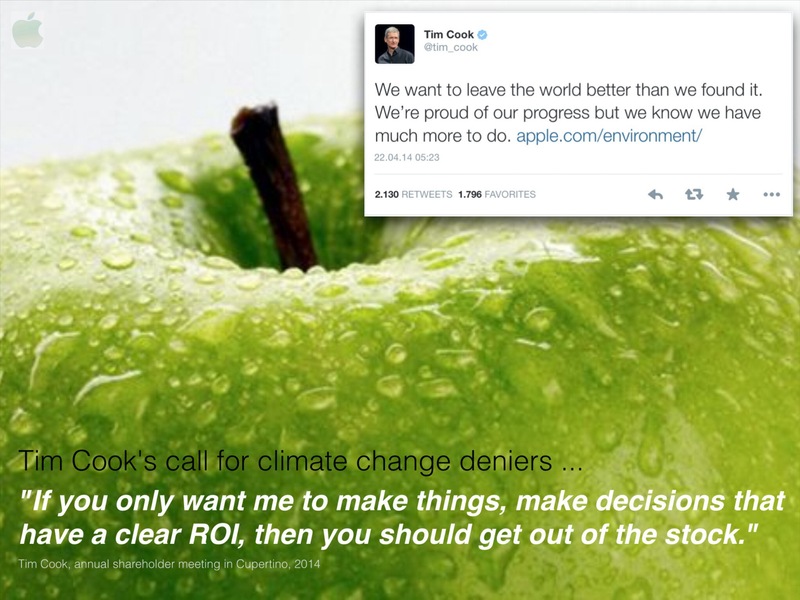 Cook’s call for climate change deniers to “get out of the stock” is an impressive statement I never heard from any other CEO. I already reported about Apple’s supplier responsibility (see ‘Related links’) and now it’s worth looking on the environmental initiatives of the company. Here are some facts about Apple’s data centers published by the company in context with its environmental initiative in April 2014. We designed our Maiden, North Carolina, data center from the ground up for energy efficiency, and it has earned the LEED Platinum certification from the U.S. Green Building Council – the first data center of its size to be honored. On any given day, between 60 and 100 percent of the renewable energy it uses is generated onsite through biogas fuel cells and two 20-megawatt solar arrays- the nation’s largest privately owned renewable energy installation – and we purchase any remaining power we need from entirely clean sources. The Maiden center generates 167 million kilowatt-hours of renewable energy onsite per year – enough to power the equivalent of 13,837 homes. I talked about Microsoft’s construction application for installing diesel engine generators as backup-up sources for energy supply. Apple goes an alternative way. With several energy-efficiency tricks, biogas-powered fuel cells and a giant 20-megawatt solar array Maiden will be one of the most environmentally benign data centers ever built. Beyond Apple’s eco-bragging rights, this data center should provide valuable insights to the rest of the cloud computing industry. Stationary fuel cells are certainly well proven, but multi-megawatt installations are pretty rare. 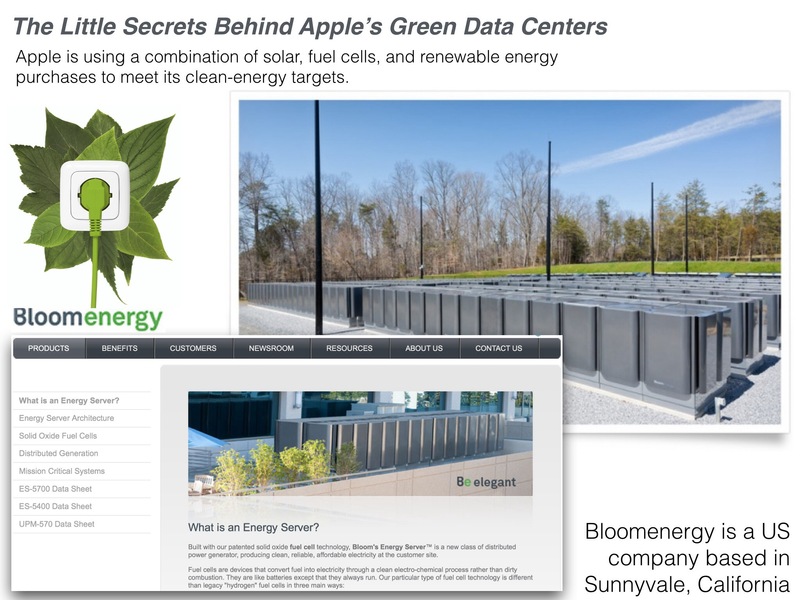 Data center customers for Bloom Energy, which is supplying Apple in North Carolina, typically have far less than a megawatt installed. Each Bloom Energy Server, which takes up about a full parking space, produces 200 kilowatts. By going to 10 megawatts of capacity, Apple can claim the largest fuel cell powered data center, passing eBay which earlier this year announced plans for six megawatts worth of fuel cells at a data center in Utah. Using fuel cells at this scale potentially changes how data center operators use grid power and traditional back up diesel generators. With Apple’s combination of its solar power and fuel cells, it appears the facility will be able to produce more than the 20 megawatts it needs at full steam. That means Apple could sell power back to the utility or even operate independently and use the grid as back-up power – a completely new configuration. Finally I would say that there are not only innovative ideas implemented in Apple’s product line-up but also in it’s ecosystem. A fact which is left behind when talking about Apple’s power as one of the most innovative companies in the world. An official spot about “leaving the world better than we found it”. It all started with implementing unlimited capabilities into electronic devices and it ends in unlimited pollution of our environment. “Think different” now means to replace limited classical energy sources by natural unlimited sources. The reason why it doesn’t take place today is just money. Selling cheap electronic devices goes along with ignoring the fact that there is a climate change, and pollution of air and water. Thanks for going green or blue or whatever you call it. Next Post Fragmentation? Tap Forms.